Welcome to VIVOE slime supplies kit. Here are fantastic various slime supplies kit to help you make your own slime shop,have you the unique slime recipe? These beautiful slices are decorated with lovely shapes such as fruits and cakes. They are both fun and creative for the soil. You can choose different stuff make fancy slime opinion(colorful foam beads,fishbowl beads,fruit slices, various glitter jar,mylar flake) decorations your own slime supplies kit, DIY your slime party . VIVOE Slime Supplies Kit can be used as weddings, birthdays, baby showers and celebration decorations for making mucus, vase filling, gift box, flower arrangement, DIY craft, family wedding decoration, etc. Warm Tips: Not suitable for children under 3 years old, can only play, not edible. VIVOE guarantees all buyers 100% satisfaction, once you find any problem of the product please feel free to contact us, we will solve it as soon as we can. ❤ 【WIDELY DISTRIBUTED】: A total of 72 equipment. 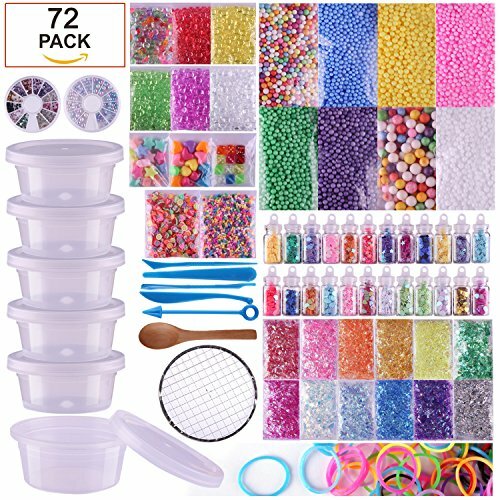 There are 24 glitter tablets bottles, 12 color sugar paper ,8 color slime foam ball,6 color fish tank beads, 6 storage containers,5 tools,3 candy sweets beads (heart-shaped, square, pentagonal),2 Disc (Pearl, Round Diamond),1 Net,1 wooden spoon,1 rubber band , 1 fruit slice ,1 candy granule,1 Pom Poms.Let you choose colors according to your preferences. Customize your mucus according to your preference. ❤【 FANTASTIC】:These beautiful slices are decorated with lovely shapes such as fruits and cakes. They are both fun and creative for the soil. You can choose different stuff make fancy slime opinion(colorful foam beads,fishbowl beads,fruit slices, various glitter jar,mylar flake) decorations your own slime supplies kit, DIY your slime party . ❤【WIDE USES】:VIVOE Slime Supplies Kit can be used as weddings, birthdays, baby showers and celebration decorations for making mucus, vase filling, gift box, flower arrangement, DIY craft, family wedding decoration, etc. ❤【100% SATISFACTION GUARANTEE】 - VIVOE guarantees all buyers 100% satisfaction, once you find any problem of the product please feel free to contact us, we will solve it as soon as we can. Warm Tips: Not suitable for children under 3 years old, can only play, not edible.t us, we will solve it as soon as we can. Warm Tips: Not suitable for children under 3 years old, can only play, not edible. If you have any questions about this product by VIVOE, contact us by completing and submitting the form below. If you are looking for a specif part number, please include it with your message.